As Christmas Day comes ever closer, one of the big releases during the holiday (that isn’t Star Wars) is The Big Short. Based on the book of the same name by Michael Lewis, the film tells the true life story of how a group of bankers and analysts predicted the 2008 housing market crash in the United States, and made billions of dollars off of this gamble. The film itself doesn’t exactly sound like a sure bet, but there are a few pieces that made me extremely curious about this film. Not only the amazing ensemble that’s been put together for this film, but it’s also writer-director Adam McKay’s first foray into territory that we’ve never seen him step into. Since McKay is best known for his work with Will Ferrell for the past 15-20 years, we now see him direct a drama about wall street and corruption, which sounds really fascinating. Here’s my review of The Big Short. We have several stories going on all at once that intersect each other throughout the film. The man who begins to predict that the housing market is on the edge of collapsing is Dr. Michael Burry (Christian Bale), a shorts wearing head of a hedge fund in California. When word gets out that he’s gambling away billions of dollars on this idea, Wall Street first laughs at it and thinks that he’s insane. Everybody except for people like Mark Baum (Steve Carell), whose apart of Morgan Stanley, and Jared Vennett (Ryan Gosling) a hot-shot Wall Street analyst who works with Baum in making sure that this a sure thing. We also have another story of two aspiring bankers who get in on the gamble with Brad Pitt’s Ben Rickert. What ensues is some of the most riveting sequences about Wall Street jargon that has ever been put to film. McKay, who co-wrote the screenplay with Charles Randolph, turns out to be the perfect filmmaker to bring Lewis’ book to life. Reading interviews with the filmmaker, he’s a guy who has had a huge interest in this area for years, and an original draft of his 2010 film The Other Guys was supposed to involve Wall Street, insider trading, and all of that stuff, but ended up getting mostly scrapped. Since he’s been directing comedic actors like Ferrell, Carell, and others for years in low-brow comedies like Anchorman and Talladega Nights, he can direct actors almost like its nobody’s business. The performances by all of the actors in the film are incredible, with Bale and Carell being the undisputed best performances of the film. Bale plays Burry almost as if it’s the real Burry on-screen (if you’ve seen the real life man in interviews). There’s a calmness to how he portrays this character, with this Rain Man-esque genius to him, and how he can read Excel spreadsheets on faulty loans that, as his boss played by Tracey Letts in the film says, is just created for lawyers to argue about. He spends most of the film in his office, with his drumsticks in hand as he calculates these numbers, goes to the banks, gets chewed-out by his bosses, and ridiculed by colleagues and investors who think he’s gone mad. It’s another performance from Christian Bale that continues to prove that’s he’s one of the most fascinating and chameleonic character actors of all time. I really loved Steve Carell as the energetic and constantly pissed-off Mark Baum, as its one of his best screen performances to date. Anybody who loves films like this one that are carried by the strength of the actors and its ensemble will fall in love with The Big Short, even if a film about the housing crisis doesn’t exactly sound like an exciting idea for a film. What McKay is able to do with the film and its ingenious screenplay is that he’s able to take a lot of these Wall Street terms and jargon and make it appeal to the average American watching this film in the theater who hasn’t the slightest idea about what these characters are talking about. This is a film that you definitely need to pay attention to in order to catch every little detail of this story, but it’s presented in a way that won’t make your head explode with you trying to figure out what the hell is going on. The film does have a few flaws. While the storylines involving Bale, Carell and Gosling’s characters are exciting and riveting to watch due to the amount of talent that those actors have, the weakest storyline involves Pitt and those two bankers. The bankers, played by Finn Wittrock and John Magaro enlist Pitt for what is a sort of glorified cameo by the actor (he’s a producer on the film along with his production company, Plan B) to help them figure out this gamble, and how much money they could make off a gamble that will cost the American public everything. While there storyline isn’t bad, it’s a really good one, it’s just not as compelling as the other two ongoing storylines. I also felt that Marissa Tomei, who plays Carell’s wife in the film, was another glorified cameo, and they could’ve gotten any actress to play that role. Which is a shame, since Tomei continues to be one of the best actors working today. What’s interesting about The Big Short is how it ends. I don’t I’m giving anything away in saying that everybody involved made a ton of money off of this crisis, but it does pose a bit of an interesting question at the very end of the film. Is it morally right that these guys, who aren’t sleezebags like the rest of Wall Street, profit off the biggest economic collapse since the Great Depression? Unlike The Wolf of Wall Street, where the characters in that film didn’t seem to have any regret about what they did, these characters seem a little more human, and realize that while they are making a lot of money during this period, others aren’t, and continue to do eight years later. It’s that, along with the great performances, direction and screenplay by McKay that help make The Big Short one of the best films of 2015. It’s one of the smarter and unique studio films to be released during the year, and one that I highly recommend if you’re tired of going to see Star Wars at this point. 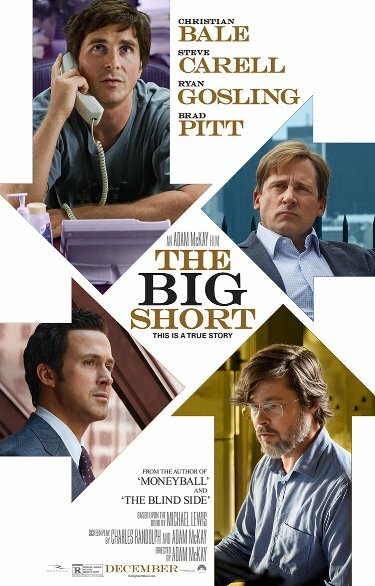 There are a lot of interesting films being released before 2016, so if you are having some trouble finding one, I recommend you go and check out The Big Short.